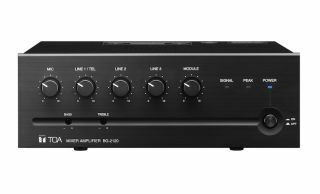 The What: The TOA BG-2240D provides an update to the company’s BG-2000 series of mixer-amplifiers. The What Else: The new BG-2240D is an enhanced model, incorporating a 240W Class D amplifier stage to accommodate larger projects. Like the other BG-2000 models, the BG-2240D allows the user to select from 8 Ohm, 25V, and 70V power outputs and has four inputs (Mic, Tel, 2-Aux) plus a module slot which works with any 900 series module for added functionality (such as an additional mic input, sound module, etc.). Mute send/receive functions are assignable per input as well as the Music-On-Hold/2nd Zone output, which may be used for system expansion. There is also a VC terminal for use with a 10K volume control for remote master volume.